A mercenary is an individual who is hired to take part in a conflict but is not part of an army or other-governmental organisation. Mercenaries fight for money or other forms payment rather than for political interests. In the last century, mercenaries have increasingly come to be seen as less entitled to protections by rules of war than non-mercenaries. Indeed, the Geneva Conventions declare that mercenaries are not recognized as legitimate combatants and do not have to be granted the same legal protections as captured soldiers of a regular army. In practice, whether or not a person is a mercenary may be a matter of degree, as financial and political interests may overlap, as was often the case among Italian condottieri. The Punics, also known as Carthaginians, were a people from Ancient Carthage who traced their origins to the Phoenicians. Punic is the English adjective, derived from the Latin adjective punicus to describe anything Carthaginian. Their language, Punic, was a dialect of Phoenician. The "Sacred Band" consisted of a small heavy infantry unit of 2000-3000 men, who were "inferior to none among them as to birth, wealth, or reputation" and distinguished by "the splendour of their arms, and the slowness and order of their march". [ citation needed ] Trained from an early age to be tough phalanx spearmen, these men were from wealthy Carthaginian families, and as such were able to afford high quality armor and weapons. They fought as a traditional phalanx organized in the Hellenic style. At the Battle of the Krimissus in Sicily in 341 BC, the "Sacred Band" fought as a well-organized phalanx. It was utterly destroyed. Two thousand citizen troops (perhaps a similar unit), are recorded as being in Sicily in 311 BC, the last time that citizens troops are recorded as being overseas. By 310 BC, the Sacred Band appears to have been reformed, only to be destroyed in the Battle of White Tunis against Agathocles. Agathocles was a Greek tyrant of Syracuse and king of Sicily. The First Punic War was the first of three wars fought between Ancient Carthage and the Roman Republic, the two great powers of the Western Mediterranean. For 23 years, in the longest continuous conflict and greatest naval war of antiquity, the two powers struggled for supremacy, primarily on the Mediterranean island of Sicily and its surrounding waters, and also in North Africa. The Mercenary War, also called the Libyan War and the Truceless War by Polybius, was an uprising of mercenary armies formerly employed by Carthage, backed by Libyan settlements revolting against Carthaginian control. The Third Punic War was the third and last of the Punic Wars fought between the former Phoenician colony of Carthage and the Roman Republic. The Punic Wars were named because of the Roman name for Carthaginians: Punici, or Poenici. The Second Punic War, also referred to as The Hannibalic War and by the Romans the War Against Hannibal, was the second of three wars between Carthage and the Roman Republic, with the participation of Greek polities and Numidian and Iberian forces on both sides. It was one of the deadliest human conflicts of ancient times. Fought across the entire Western Mediterranean region for 17 years and regarded by ancient historians as the greatest war in history, waged with unparalleled resources, skill, and hatred. It saw hundreds of thousands killed, some of the most lethal battles in military history, the destruction of cities, and massacres and enslavements of civilian populations and prisoners of war by both sides. Hamilcar Barca or Barcas was a Carthaginian general and statesman, leader of the Barcid family, and father of Hannibal, Hasdrubal and Mago. He was also father-in-law to Hasdrubal the Fair. The Battle of the Bagradas River, also known as the Battle of Tunis, was a Carthaginian victory over Rome in the spring of 255 BC during the First Punic War. The greatly superior cavalry of the Carthaginians and their allies permitted a pincer attack on the Roman infantrymen, provoking a rout and slaughter. The Battle of the Crimissus was fought in 339 BC between a large Carthaginian army commanded by Asdrubal and Hamilcar and an army from Syracuse led by Timoleon. 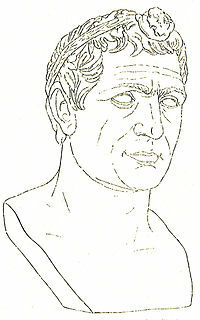 Timoleon attacked the Carthaginian army by surprise near the Crimissus river in western Sicily and won a great victory. When he defeated another much smaller force of Carthaginians shortly afterwards, Carthage sued for peace. The peace allowed the Greek cities on Sicily to recover and began a period of stability. However, another war between Syracuse and Carthage erupted after Timoleon's death, not long after Agathocles seized power in 317 BC. The Battle of the Bagradas River or the Macar was fought between Carthaginian forces and part of the combined forces of Carthage's former mercenary armies during the Mercenary War which it used to conduct the First Punic War and those of rebelling Libyan cities. After the forces of Hanno the Great were defeated at Utica, and failed to engage the mercenaries afterwards despite favorable conditions, Carthage raised a new army under Hamilcar Barca in Carthage. Hamilcar managed to leave Carthage despite the rebel blockade of the city and cross the Bagradas River. Rebel armies from besieging Utica and the camp guarded the bridge on the Bagradas River. Hamilcar Barca, by brilliant maneuvering, defeated the combined rebel army. This was the first major Carthaginian victory of the war. A description of the battle forms one of the grandiose set-piece scenes of Gustave Flaubert's novel, Salammbo. The Battle of Utica was the first major engagement in the Mercenary War between Carthaginian forces and part of the combined forces of the former mercenary armies previously deployed by Carthage to conduct the First Punic War and those of rebelling Libyan cities. The forces of Hanno the Great broke the siege of Utica. However, they failed to prepare any meaningful defense of the city once they liberated it or to maintain proper lookouts for enemy movement. As a result, the Carthaginian forces suffered heavy losses when the mercenary forces counter-attacked, captured the Carthaginian baggage and equipment and besieged the army of Hanno within Utica. Hanno managed to regain his freedom of maneuver later but failed to capitalize on opportunities to engage the rebel forces under favourable conditions. This prompted Carthage to mobilize another army under Hamilcar Barca. Near the site of the first battle and great Carthaginian defeat of 480 BC, the Second Battle of Himera was fought near the city of Himera in Sicily in 409 between the Carthaginian forces under Hannibal Mago and the Ionian Greeks of Himera aided by an army and a fleet from Syracuse. Hannibal, acting under the instructions of the Carthaginian senate, had previously sacked and destroyed the city of Selinus after the Battle of Selinus in 409. Hannibal then destroyed Himera which was never rebuilt. The Siege of Akragas took place in 406 BC in Sicily; the Carthaginian enterprise ultimately lasted a total of eight months. The Carthaginian army under Hannibal Mago besieged the Dorian Greek city of Akragas in retaliation for the Greek raids on Punic colonies in Sicily. The city managed to repel Carthaginian attacks until a relief army from Syracuse defeated part of the besieging Carthaginian army and lifted the siege of the city. The Battle of Gela took place in the summer of 405 BC in Sicily. The Carthaginian army under Himilco, which had spent the winter and spring in the captured city of Akragas, marched to confront the Greeks at Gela. The Syracuse government had deposed Daphnaeus, the unsuccessful general of the Greek army at Akragas, with Dionysius, another officer who had been a follower of Hermocrates. Dionysius schemed and gained full dictatorial powers. When the Carthaginians advanced on Gela and put the town under siege, Dionysius marched from Syracuse to confront the threat. He planned to use a complex three-pronged attack plan against the Carthaginians, which failed due to lack of proper coordination. Dionysius chose to evacuate Gela, as the defeat caused discontent in Syracuse and he did not wish to lose his power. Himilco sacked the abandoned city after the Greeks had fled to Camarina. The Battle of Abacaenum took place between the Carthaginian forces under Mago and the Greek army under Dionysius in 393 BC near the Sicilian town on Abacaenum in north-eastern Sicily. Dionysius, tyrant of Syracuse, had been expanding his influence over Sicels' territories in Sicily. After Dionysius' unsuccessful siege in 394 BC of Tauromenium, a Carthaginian ally, Mago decided to attack Messana. However, the Carthaginian army was defeated by the Greeks near the town of Abacaenum and had to retire to the Carthaginian territories in Western Sicily. Dionysius did not attack the Carthaginians but continued to expand his influence in eastern Sicily. 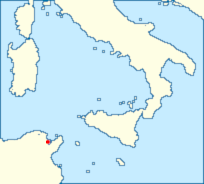 The Sack of Camarina took place in the spring of 405 BC in Sicily. Hermocrates had plundered Carthaginian possessions in Sicily from Selinus after 408 BC, and in response Carthage sent and army to Sicily under Hannibal Mago and Himilco II of the Magonid family which faced a coalition of Sicilian Greeks under the leadership of Syracuse. The Greeks were forced to abandon Akragas in the winter of 406 BC after an 8-month siege. Hannibal Mago had perished at Akragas from the plague during the siege, the Carthaginians sacked Akragas and wintered there, then attacked Gela in the spring of 405 BC. Dionysius I had become supreme commander of Syracuse by this time, but his army was defeated at Gela. Although Greek casualties were light, Dionysius evacuated the city, which the Carthaginians plundered the following day. The Greek army had fallen back to Camarina after a forced march along with Gelan refugees the day after the sack of Gela. Dionysius ordered the citizens of Camarina to leave their city instead of organizing a defence. While retreating to Syracuse, part of the Greek army rebelled and occupied Syracuse, which Dionysius later managed to recapture. The Carthaginians sacked Camarina and encamped before Syracuse during the summer, and after a while a peace treaty was signed which confirmed Carthaginian control over Selinus, Akragas, Gela and Camarina, Greeks were allowed to settle in these cities while Dionysius was confirmed as the ruler of Syracuse. Carthage had reached the apex of her control in Sicily which she would not again reach until the death of Agathocles in 289 BC.